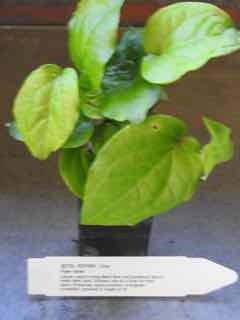 Betel Pepper plant, Piper betle, is sometimes known as Paan. Leaves of Betel Pepper plant are used to wrap Betel Nuts (the seeds of the Betel Palm, Areca catechu), together with powdered lime to make betel quid, a traditional south east Asian snack. Betel Pepper plant is a native of India and prefers well composted, moist, well drained soils in a protected, sunny position. Drought and frost tender. A tropical evergreen perennial vine, climbing to a length of 3m. PLEASE NOTE; Piper sarmentosum is widely and incorrectly known as Betel Pepper. Betel Pepper plant is botanically known as Piper betle, which has different and distinct uses to Piper sarmentosum, which we know as Vegetable Pepper.